Feather stitch is a wonderfully versatile, decorative, surface embroidery stitch that is also known as single coral stitch and briar stitch. 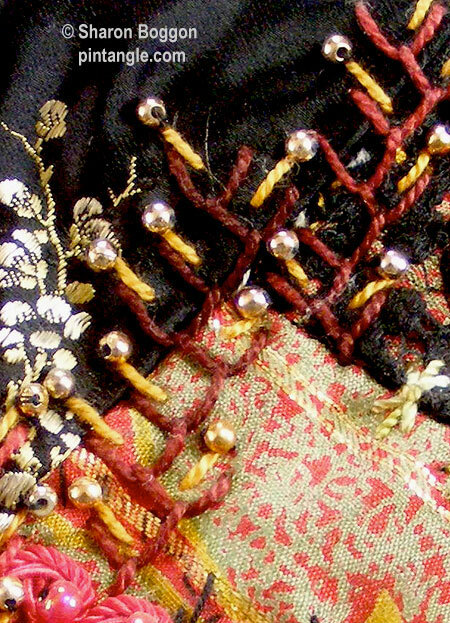 Feather stitch is found extensively on traditional English smocks, Dorset embroidery and on crazy quilts. Keep the center of the stitch on the curved line you want to follow and you will find that Feather stitch will sit on a curve easily. This ability to hold a curve means the stitch ideal to use in any motif that is organic in feel, such as, floral sprays, vines and twisting twiggy like stems. 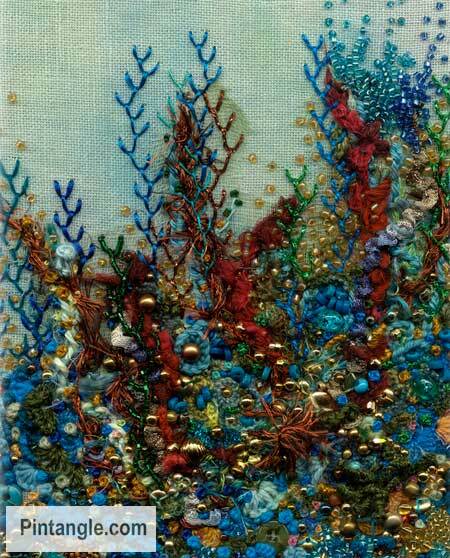 It also looks great in underwater scenes as the flowing lines are very suitable to represent corals and seaweed. Feather stitch can vary greatly depending on the width of space between the two tops of Y, angle of your needle, spacing changes in the the length of stitches and regularity of stitches. It really is one of those stitches you can experiment with for years and still discover new ways of using it. As you can see in the sample above I have worked 3 arms to one side and 3 to the other creating a totally different look to the stitch. In the top part of this sample ( above) I added a detached chain stitch to the ends of the arms and then worked a second row of the pattern to create a fill or complex border. You can also work it row against row to create wonderful patterns and designs. 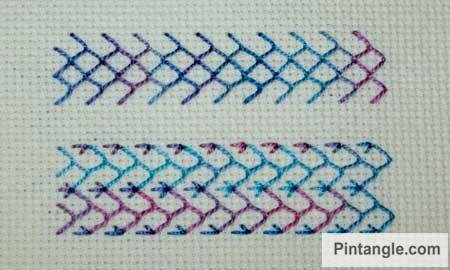 When working this stitch imagine or mark with a dissolvable pen 4 parallel lines. Bring the thread up through the fabric at the top left of where you want to create the stitch. 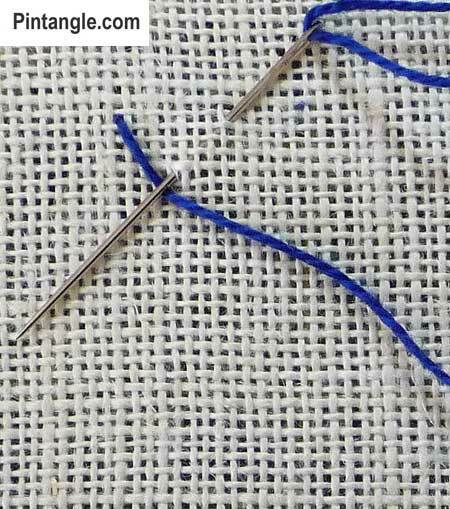 Hold the thread down with the left thumb and insert the needle to the right and a level of where the thread emerged. 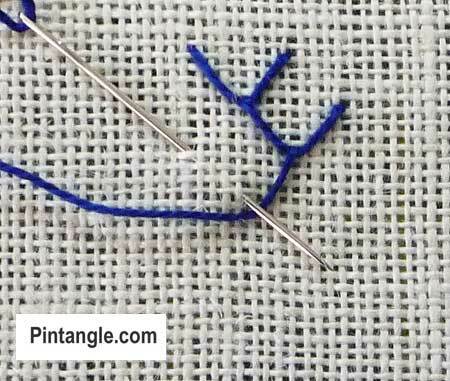 Make a stitch on a downward angle so that the needle emerges between the two points as illustrated. With the thread wrapped under the needle, pull it through the fabric to make the stitch. Insert the needle to the left and a level of where the thread emerged. 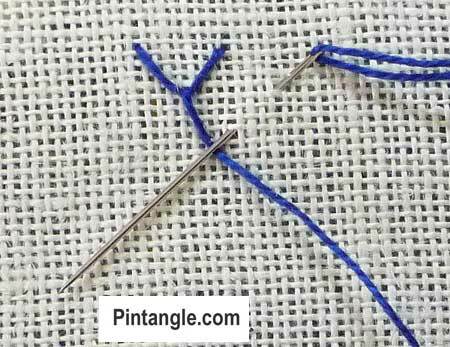 Make a stitch on a downward angle so that the needle emerges between the two points as illustrated. With the thread wrapped under the needle, pull it through the fabric to make the next stitch. Work these movements alternatively down the line. Hopefully there will not be too many tangles! Sharon, as always your work is so exquisitely inspiring!! The piece with the red and hold cloth is so beautiful that I unmediated captured it for my next screen wallpaper as it reminds me of the sea!! It includes the Fly and Buttonhole, too, as I added to my ‘Slow Cloth’ for these stitches while I got a feel for timing and what to use the stitches on. I have finished my little Feather Stitch piece. Here you can see my feather stitch. Here comes my attempt of feather stitch. I finally uploaded my feather stitch sample, along with some more buttonhole stitch. http://nipetnapet.blogspot.com/2012/01/tast-week-3.html Loved the Feather Stitch, I found it so versatile and fun! Was just able to finish up week 3 and am just having a blast! With so many beautiful works this week, I'm inspired even more for next week! 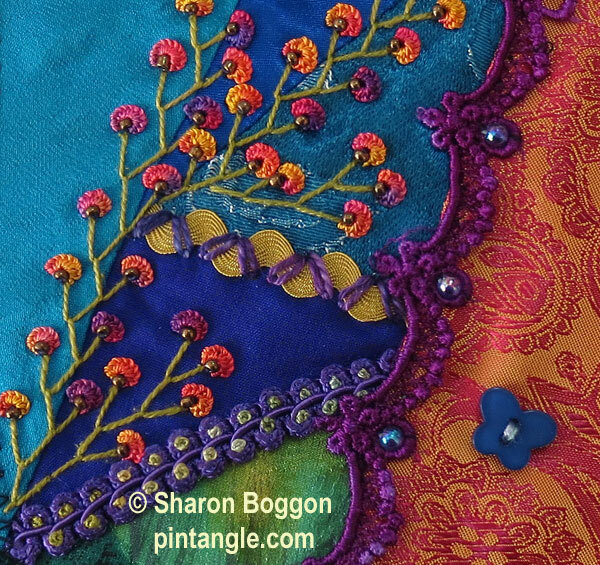 Sharon, I really like the featherstitch, and I'm especially enjoying seeing all the variations for the different stitches. I'm late once again, but here is my simple rendition of the feather stitch. Here's my little bit of stitching for week 3. I showed already older work, but here is my new feather stitch embroidery http://borduurblog.blogspot.com/2012/01/feather-stitch-taksteek.html . Better late than never right? I finally took a picture of my experimentation on feather stitch. It is a good stitch and so much more could be done with it. I was glad to learn this stitch, which is new to me! Also just to say a huge thank you to Sharon for all the hard work she puts into this and the pleasure viewing all the wonderful creations give me. Just posted my buttonhole and feather stitch sample. I'm enjoying revisiting these stitches and seeing some "old friends" on here! Not very imaginative but I am trying to get this sample filled. I also have a give away. 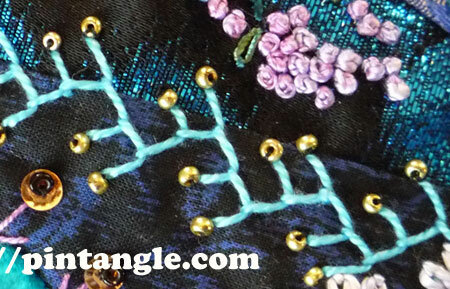 I have posted my feather stich motif in my blog. See you Soon! ~Debra S.
I choose some Aida fabric to make sure I was going to stitch the rows I was planning! Well done everyone, some truely inspirational work again this week! Here's my Feather Stitch blog post: http://kirajones.co.uk/?p=574 I'm learning loads! My sample is at http://www.timelessriverstudio.blogspot.com/ . 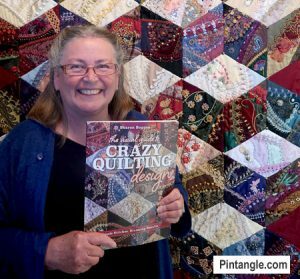 Thanks Sharon this is a great project. I have had to re-learn this stitch as I haven't used it in years. I also had to re-learn that overdyed threads are not colour-fast. Oh Dear! I was rather intimidated when I saw this stitch, and put it off until Saturday. After learning it, I think it may be my second favorite stitch (my top one is still the blanket/buttonhole). What a joy to learn the feather stitch this week! Here is my bead mandala for feather stitch week 3, I wonder what the next stitch will be ? you can find my example here……………….. I liked this stitch, had fun playing with it. Embroidered with pleasure all three stitches just as she was on vacation. My job here. I added some beads. Happy weekend for all! View my TAST #3 feather stitch here http://www.flickr.com/photos/susie_w/6733724719/in/photostream#/ It is a basic feather stitch. I was surprised to note that the angle of the added leaves created diamond shapes and almost changed the shapes of the feather stitch. Interesting. J'aime beaucoup ce point . Je l'ai mis en scène sur une petite pochette avec l'aide de la Fée Plume . I like this stitch. Very relaxing and adaptable. with a link back to my earlier samples. Also 2 CQJP blocks are posted in Flickr. I directly done 3 designs without doing the trial stitch. my post for feather stitch. I think its in progresss. i've added a couple of playful feather stitched "vines" to my project. A really nice and easy stitch this week and the third stitch pleasure! Didn't care for the buttonhole, but really enjoyed feather stitch. Funny how two stitches so similar in technique can feel so different when working! to see part of my adventures with this stitch. I incorporated it again into a bigger work I'm already embarked on, and had a good time doing it! I do enjoy the surprise each week of a new stitch to either review or learn, and incorporate into ongoing work. And I've been very pleased with the nice people who've stopped by and commented on my blog, an expected side benefit! Here is my work of this week. 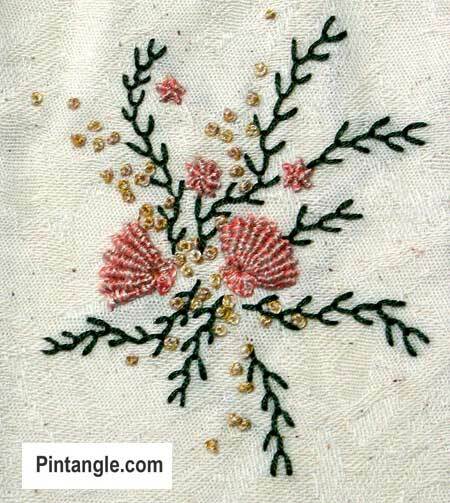 All points of this embroidery are feather points, even the flowers and leaves. My daughter Pauline (9 years old) has also done his homework . Hello! this is my sample. thank you for visiting!! Here's my work on the feather stitch, including shots from an older project of mine. http://debbiesfiberwork.blogspot.com/2012/01/tast-week-3.html Thanks, Sharon. I decided to make a flowering bush on my March block. So much fun seeing everyone's take on the stitches- some incredible work out there! Had a little trouble with this one I have to say. This week I stitched a sampler and I took it a little further with a second piece. I have avoided feather stitch for years, not needing it for CQ. However, I love it!! ??? Feather Stitch/ ??? "??????" Hi sharon, this is my work for feather stitch ! Thanks Sharon for including my work in last weeks highlights. My embroidery with all 3 weeks stitch can be found here, thanks Sharon this is a great challenge. I am working on a new piece for the Feather Stitch, but NOTHING will top my Tessalating Fish Lips from TAST 1. I was a bit surprised at what I figured out to do with this stitch. Although I enjoy using it–I didn't think there would be much variety that I could do with the stitch. I also realized how close to the buttonhole stitch this is. Truly one of my favorite stitches. I had to hold myself back a bit this afternoon to keep from simply decorating the entire rest of my quilt with it! I’m sorry I there’s no link to Pintangle, I have some trouble with Blogger after upgrading my browser. I’ll add them later. http://christinaroland.blogspot.com/2012/01/tast-week-3.html Another first for me, another stitch and a whole new aproach. Free work for the first time in my life. I really enjoy this challenge because I'm learning a whole new craft this way. And I'm enjoying all that is still to learn as I watch other participants creating the most beautiful work. I think I'll try adding to it this time. Connie. the feather stitch sampler I did earlier is posted here. 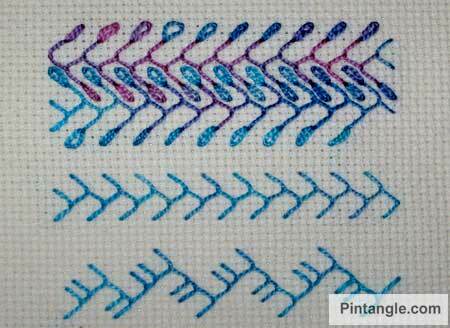 I like the look of this stitch! I think I'm going to keep practicing and work on something more fancy! Cannot wait to start stitching. This is a wonderful stitch. Another stitch I did earlier: http://borduurblog.blogspot.com/2008/07/taksteek.html . In Dutch it is the "taksteek". Of course I am going to make something new as well. One of my favorite stitches. So beautiful. Yay, another one of my favourite stitches! Not just because of the swedish name, kråkspark, that literally means crow kick. My fingers are already itching to start.